Emuge is our first choice for all thread cutting applications, and we carry a range of standard items to support our customers’ day-to-day thread cutting requirements. From volume products to highly specialised bespoke items, Emuge’s experience and technical knowledge provides a trusted foundation on which this quality product is built. Company profile Emuge-Franken is a world renowned company supplying Thread Cutting, Gauging, Clamping and Milling products for more than 90 years. 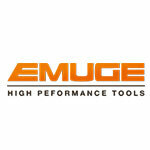 Hard Metal and Emuge have enjoyed an exclusive relationship in Ireland for many years. The Emuge product is a further quality staple in the brand portfolio, delivering advanced threading solutions to our customers throughout the Island. Emuge’s technical team supports the product offering with a deep understanding of thread cutting technology, materials and machining parameters.